Abstract Construction, a full-range construction services company, announced it was named one of the Dallas Business Journal’s “Best Places to Work.” The 13th annual awards ceremony, which took place June 25, recognized 100 local workplaces ranging from 10 employees to more than 999,9999 employees. Abstract Construction was recognized in the newly created Micro category, which represents companies with 10 to 24 employees. In keeping with the event’s “super hero” theme, Abstract employees showed their fun-loving spirit by wearing crime-fighter costumes to the awards luncheon. The characters they represented included Superman, Thor, The Flash, Captain America, and Robin. 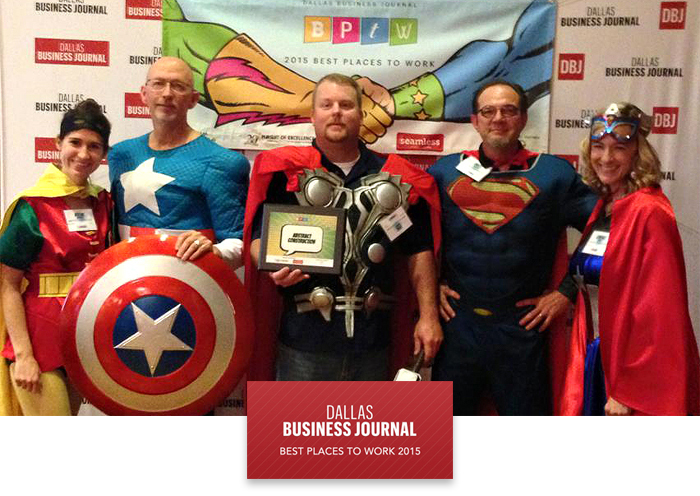 Dallas Business Journal’s “Best Places to Work” awards are based on data compiled by independent research firm Quantum Workplace.